Although a wombat is almost completely helpless against the predations of humans, it does have some defences against the other introduced predators that beset it: wild dogs and foxes. Domestic dogs have been deserting their human masters, and humans have been dumping unwanted dogs and pups in the Australian bush ever since the first colonists brought dogs to the country. The abundance of marsupials, both large and small, around the early settlements would have provided them with an easy living; but they became a nuisance when the bush and the marsupials were cleared to make way for sheep and cattle, and they are still a major problem in many areas. Cross-breeding between feral dogs and dingoes has produced a motley horde of wild dogs. As mentioned in Chapter 1, the dingo probably came to this country with a late immigration of Aborigines about 3500-4000 years ago, and on the mainland it gradually replaced the thylacine, the only marsupial carnivore of comparable size, and the smaller Tasmanian devil. Wild dogs and dingoes not only kill stock; they also slaughter native animals of all kinds in untold numbers, and at or near the top of the menu in south-eastern Australia are two of the slower-moving marsupials: the swamp wallaby and the bare-nosed wombat. Dingoes are known to have killed nearly 10% of the small population of northern hairy-nosed wombats in 2000-01. A dingo-proof fence has since been built around all the wombat habitat in Epping Forest National Park. It seems from my observations that every individual wombat has to learn that wild dogs and foxes are potential enemies. None of the young wombats I have reared has shown any instinctive fear of dogs and foxes, either of their barking and howling or of the scent of their scats and urine. Nevertheless, the wombats' awareness of the possibility of attack by a predator is shown by the fact that they are instantly alert at the sound of a footfall or at any other slight sound in the bush that may spell danger. A wombat grazing in a forest clearing, or trundling along a track, or even sitting drowsing near its burrow, is deceptively unconcerned; at the slightest hint or crackle of danger it is instantly alert and often running for cover. Escape to the nearest burrow, crouch slightly with the broad reinforced rump presented towards the entrance, give a powerful thrust upward or sideways if anything - a predator's head, a human hand -touches the rump, and crush it against the roof or wall of the burrow: the method is very effective, provided that there is a burrow or similar refuge nearby and that the wombat can reach it before being attacked. Caught out in the open, a wombat is not defenceless either. Its powerful jaws can deliver a crushing bite; the long, forward-pointing lower incisors, driven at an enemy in a stabbing lunge, can inflict deep and severe injuries. An adult wombat in good health can usually hold its own against a single dog, but it has little chance against a pair and none at all against a pack. Foxes were originally brought out to Australia in the mid-1800s to provide sport for several hunt clubs. Later, in the 1870s, foxes were deliberately released in Victoria, and they gradually spread over the rest of Australia. There are now very few places on the mainland where they are not found. In 2000 there were rumours that foxes had been introduced into Tasmania and this has since been proved to be true. Several scats have been positively identified as fox, using DNA techniques. At first, foxes were hailed as the answer to the rabbit problem, but their love of poultry and lambs caused a bounty to be put on them; since early this century they have been declared vermin in all states. Foxes do not eat just rabbits and chickens and lambs, however. They will eat almost anything that lives - plants, insects, frogs, fish, lizards, birds and mammals - and carrion of all kinds. They can chase and kill animals much larger than themselves - there is a report of a fox attacking and killing a euro - and there is no doubt that they sometimes kill wombats. Young at heel and newly independent immature wombats would be the easiest prey; old or weakened adult animals would also be vulnerable. 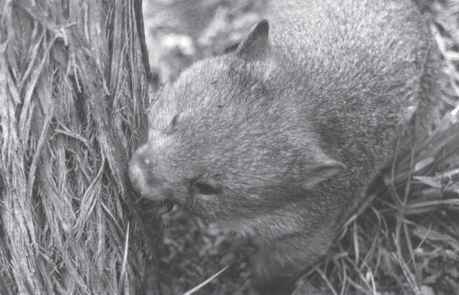 The crushed skulls of foxes have also been found in wombat burrows, so obviously the wombat is sometimes the victor.